In allergy and autoimmune diseases, the immune system is activated abnormally. In case of primary immunodeficiency, the immune system is weakened. Thus patients with this condition may experience repeated infections or serious bacterial infections like pneumonia, bone infections, meningitis, deep seed abscesses. 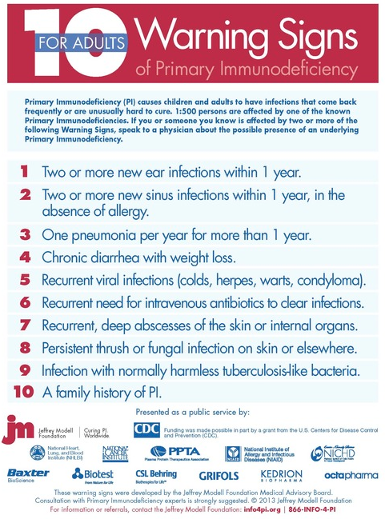 Early recognition of signs of primary immunodeficiency is important to prevent repeated serious infections leading to organ damage that can be dangerous or even life threatening. There is a range of primary immunodeficiency diseases ranging from antibody deficiency to lymphocyte disorders as seen in SCID, a Severe Combined Immunodeficiency as seen in "Bubble Boy." Begining in December 2012, the state of Texas joined Wisconsin, Massachusetts, California, New York, Michigan, Mississippi, Delaware, Connecticut, Colorado, Minnesota, Florida, Ohio, Utah, Washington, and West Virginia in newborn screening for SCID. Newborn screening for SCID adds to a panel of 28 rare other genetic conditions that are screened in Texas. While antibody deficiency treatment can be done at any immunology clinic, SCID treatment is an emergency in the newborn requiring early bone marrow transplantation that is done at speciliazed Pediatric Allergy/Immunolgy programs. Please come for a discussion if you or your family experience frequent infections as seen above to see how we would help and treatment options we offer. 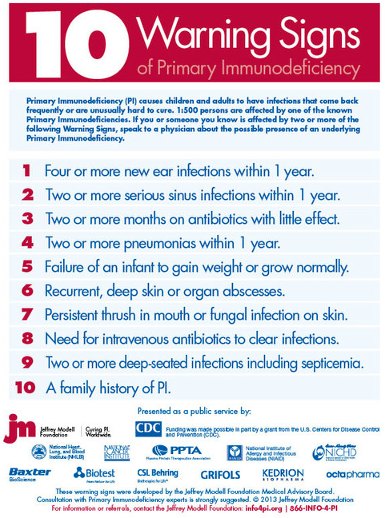 Below is the 10 warning signs of primary immunodeficiency diseases for children and adults advocated by the Jeffrey Modell Foundation. 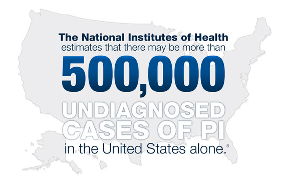 You can read more about other primary immunodeficiency diseases by clicking on the link here.